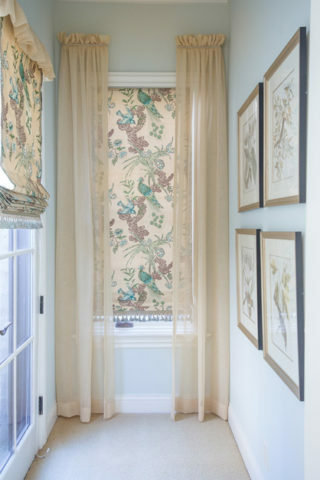 Chintz is a glazing that is applied, usually to a cotton textile, that gives it a crisp texture and lustered appearance. I use the word luster, because it really isn’t a shine, but more of a glaze, similar to tile, that creates a richness to a textile that without it can appear chalky. Chintzes look as if they have been meticulously starched and ironed by a German housekeeper. This exacting crispness brings a freshness to a room and adds another interesting layer to any room of your house. For ages past, chintz was used on slipcovers to bring a sense of lightness to stodgy interiors. 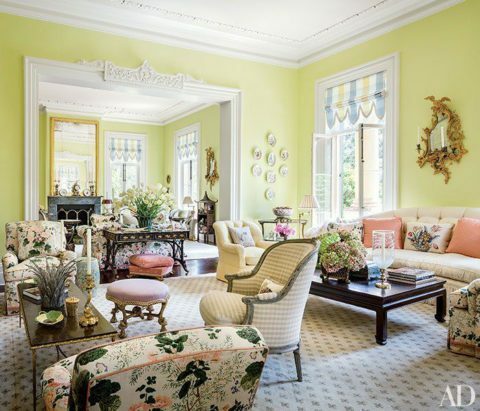 The English would (and some still do) cover all of their upholstery in the same chintz during the summer to give their interiors a garden-like appearance. Of course, this is perfectly understandable since the English have been the leaders in floral garden designs for more than a century. With scores of blooming flowers, from their world-famous roses to hollyhocks and delphiniums, chintzes are commonly covered in bouquets of flowers in riotous colors. But chintzes can be solids, stripes or small patterns. The qualifier is that the fabric is glazed. This chintz coverlet has been Quilted to offset the beautiful hollyhocks and florals repeated on the drapery panels. But, how can you use this new trend in your home. 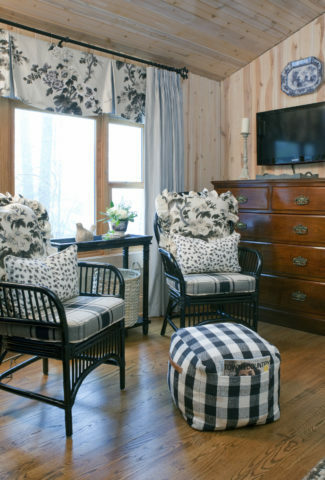 Well, I think chintz gives relief to rooms that have heavy textures, such as wools, velvets or felts. The glint of light that a chintz catches brings a brightness to an otherwise matte landscape. 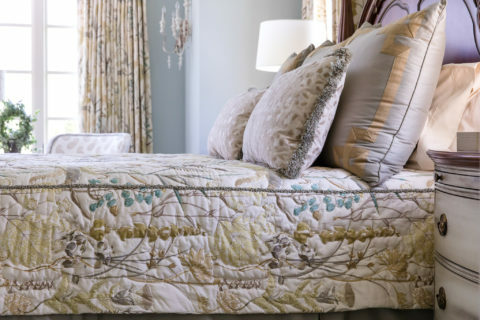 In bedrooms, a solid chintz can convey a light, fresh mood that is easy to relax in. Think starched sheets: this crisp look and tactile feeling that a polished cotton can bring to a bedroom will give you a reason to want to nap. (Not that you need one.) And in a kitchen, chintz instantly conveys a country aesthetic to what can be a difficult room to decorate due to the amount of hard surfaces and appliances. I am obsessed with country kitchens and chintz is the perfect foil to create a sense of ease and charm. Small ditty prints on a glazed cotton bring a light-hearted mood. The light reflecting off the chintz is like catching a ray of sun as you go about prepping meals or cleaning up after a family dinner. 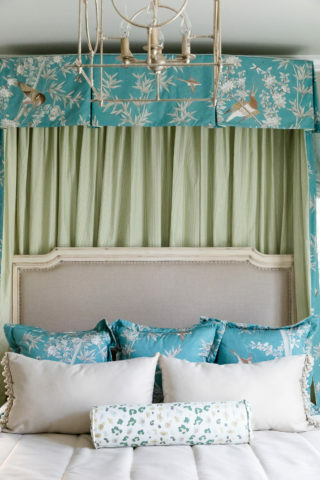 Again Miles Redd for Schumacher gives us an updated Chinoiserie style pattern that we’ve balanced with casual ticking striped and linen upholstered headboard. The main thing I love about chintz is that it can be dressed up or down. You can have a formal floral print that is glazed and it just enhances the formality of a room with crystal chandeliers and candlelight. 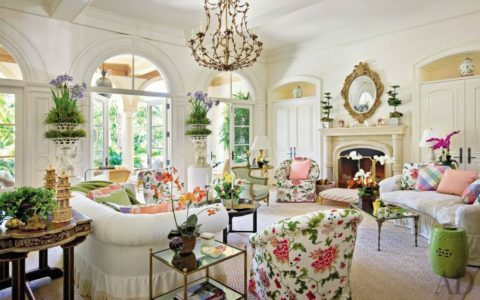 Or, in a sunroom, playfully colored florals can create a light-hearted appearance in the bright light of day. At Roostica Cottage, a mountain retreat I paired Pyne Hollyhock with many casual elements to create a balance of the masculine and feminine. Chintz is a very versatile fabric that can easily be added to any room of your house to bring elegance or ease. That’s what makes it a great trend today because it can be used in a myriad of ways that you won’t easily get tired of using it, or looking at it. 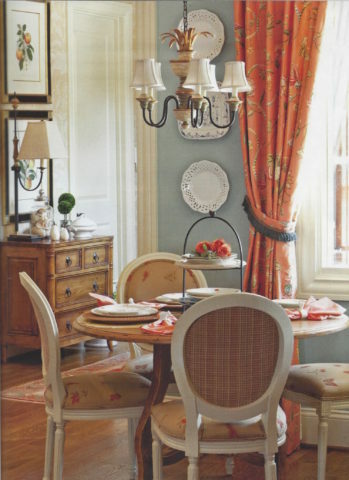 Take a moment and think of where you can use chintz in your home to turn up charm or tone down a serious mood. I promise you’ll love the result of how it looks in your rooms.